Shaheen Bagh prides itself in being a couple owned boutique resort. The place is owned and managed by husband-wife and their team that works relentlessly to provide exceptional living experiences. Mr. Arun and Sandhya Gupta are truly humble, warm and hospitable people. They both love nature and enjoy the beauty that mountains of Uttarakhand have to offer. That’s why, after Mr. Gupta retirement , the duo started Shaheen Bagh- a place that combines the best of natural beauty with their warmth and love for entertaining guests. 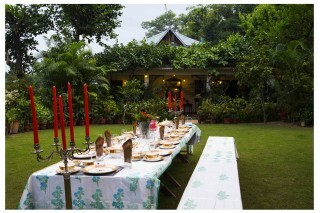 In the last few years, Couple have made Shaheen Bagh a place where guests enjoy the experience of a lifetime. Everything about this place reflects their character and their enthusiasm. For instance, Mrs. Gupta’s love for reading is reflected in the ‘My Fair Lady’ styled library, whereas Mr. Gupta’s penchant for movies can be seen with his DVD collection of over 5000 movies. Arun Gupta, a wildlife enthusiast, an avid bird-watcher and a nature-photographer has ensured that this place truly captures the essence of countryside. 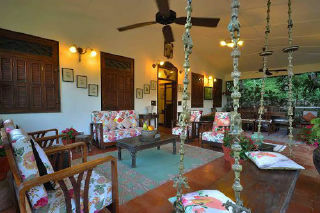 That’s why, he and Mrs. Gupta have devotedly nurture the expansive gardens of the place. It’s the couple’s passion to help people. That’s why they recommend a tech-free holiday at Shaheen Bagh. They ardently believe that staying away from phones and laptops (as long as possible), while exploring the nature through treks, hikes or just garden walks is an excellent way to rejuvenate one’s mind, body and soul. The couple is also involved in community work, educating the unprivileged and providing vocational training in stitching etc. to local women. 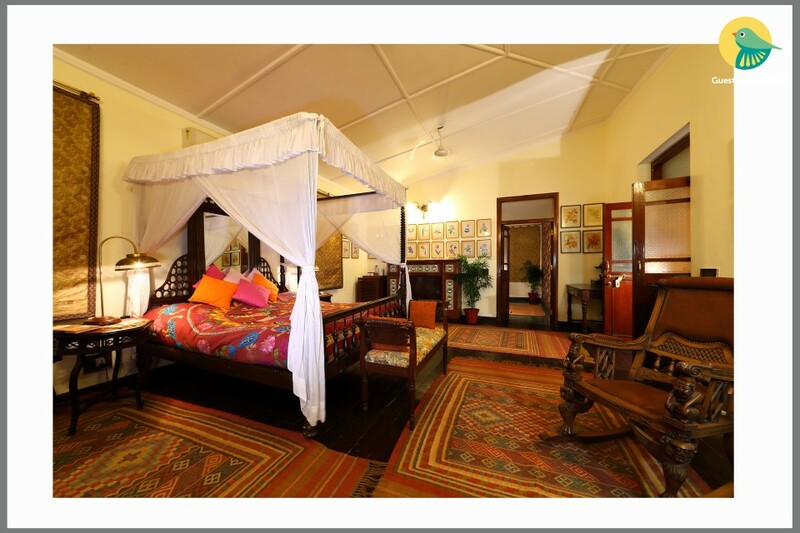 Couples genuine love for people, amicability and generosity is the reason why Shaheen Bagh is renowned for its hospitality. WHY US? A VISUAL DELIGHT The watercourses, lily pools, picturesque pathways and panoramic views ensure that Shaheen Bagh( a boutique resort & spa) serves as visual delight, reflecting the beauty and glamour of European-Colonial Era. WARMTH AND HOSPITALITY The rooms are Colonial, but the services are modern. Staff is hospitable and warm. Travelers get all the modern luxuries they need- from a rejuvenating spa, swimming pool and Jacuzzi to personalized yoga classes. 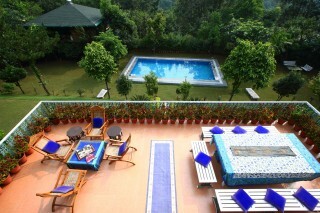 PURE PLEASURES This place is an ideal location for romantic getaways, family breaks, a typical company meetings and a pure pleasure for people looking for spa treatment in Dehradun. It’s just stone-throw away from Helipad , from where you can undertake a trip for Chardham. INCREDIBLE EXPERIENCES Picture yourself enjoying a rejuvenating time in an eco-friendly place surrounded by freshest local produce like avocado,banana,peaches, plums, mango, oranges, guava and brightly hued, blooming flowers & Spices . 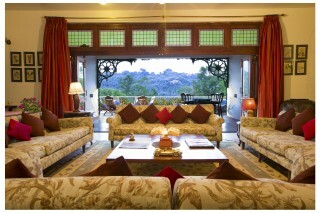 The house is designed in the style of a colonial country bungalow with sloping roofs, decorative 'monkey tops' and wide verandahs from where one can enjoy spectacular vistas of Mussoorie and the surrounding hills. 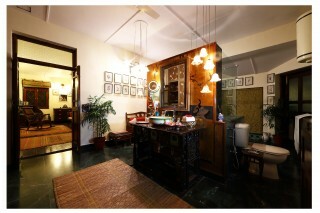 The formal dinning table, where supper is served every evening, takes up a separate niche within the common dining room. 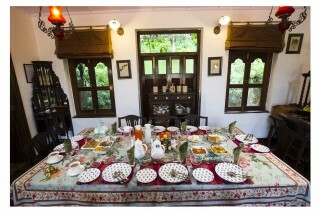 Guests are served a full English breakfast on the main verandah and lunch is usually Indian and Continental food, which is an option for the evening meal. Both Veg and non-veg is served. Nature enthusiasts can have a field day, watching a list of 370 rare species of birds.